Editors love to criticize bad writing. It’s one of the perks of the job, like free coffee or a 401(k). But it’s true that a lot of this “bad writing” doesn’t really matter. If a business document uses some puffed-up language or says “we will leverage our assets” … if a novel pours on needless adjectives like cheap cologne … if an email says “Steve will come to dinner with Molly and I” … well, aside from making my eyebrow twitch, it’s not the end of the world. Even misuse of “literally,” which is a genuine problem because it obscures meaning, is usually not a big problem. First, a little background. I volunteer several hours a week as a tutor. I work with adults who – because of difficult, often painful circumstances – never got a proper education. Usually they are working to get their GED, or high school diploma equivalent. The world looks different through their eyes. Tasks which may seem simple, like interpreting a map or using a formula, can be serious challenges. Our program uses lots of materials for teaching. 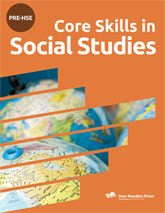 Here’s one: Core Skills in Social Studies from New Readers Press. It’s a GED prep book. I want to punch this book in the face. Regions are a way to organize places on Earth. A region includes areas with a certain shared characteristic. Regions can reflect physical geography. For example, geographers may study climate regions with similar weather patterns. Or they may study landform regions, such as mountain ranges. Regions can also reflect human geography. Ethnic regions and language regions are both examples of this. For me, that paragraph is merely boring. For the book’s target audience, it’s atrocious. Think about who’s reading this. We’re talking about someone who doesn’t know what the word “region” means. Someone who is already struggling with basic concepts, and probably with literacy too. If you don’t understand “region,” how likely is it that you’ll understand “organize,” “characteristic,” “reflect” (in an abstract sense), “climate,” “landform,” and “ethnic”? Do we really think that this clod of abstractions has made anything clearer? Do we seriously believe that someone’s going to read “areas with a certain shared characteristic” and think: Oh, that explains it! If you don’t know what a region is, the focus should be on examples, not abstract explanations. And by “examples,” I don’t mean crap like “climate regions with similar weather patterns.” We’re talking about maps, so use pictures, for goodness’ sake. The book does have one picture example, but it should have a dozen more. Instead, it has a wall of text that’s worse than useless. Why is it worse than useless? Because many of these students believe (and have been told over and over) that they are stupid, that anything they don’t understand is their fault. So when they read sentences like “Perceptual regions are also known as vernacular regions,” and don’t understand them, they actually blame themselves for the failings of these dumbass writers. A lot of times, bad writing doesn’t matter. But sometimes, it matters a lot.